How Often Do Hospitals Need Hams? Southern California has its share of earthquakes, floods, and fires. But really big disasters are rare, fortunately. On the other hand, hospitals frequently face "little disasters." Backup communications are vital, whether the disaster is an area-wide earthquake or a failure in the hospital's own telephone switchboard. Patients can be at risk in either case. Here are some statistics that show why Amateur Radio backup of communications is a real need for hospitals. 210 operating drills, mostly at hospitals and other agencies. Many other HDSCS activities at hospitals, including special event communications and demonstrations to employees and the public. About 78% of our emergency callouts were "isolated" telephone system outages such as switchgear failures and accidentally cut cables. The rest were communication disruptions due to area-wide perils such as hazardous material release, power failures, earthquakes, firestorms, and flooding. The average duration of a HDSCS emergency activation was four hours, but some lasted for 24 hours or more. An average emergency activation or standby operation required eleven HDSCS communicators. If all the phones a hospital in your area failed right now, would anyone at the hospital realize that Amateur Radio could be used as a backup, both for internal and external communications? If so, would the hospital person know how to activate hams to come to the hospital? Does the activation system include multiple points of contact, in case the first call is unsuccessful? Does an organized group of hams exist to support hospitals in your area? Would you and other hams be willing to "drop everything" and respond to an isolated communications failure at a hospital whenever called? To go to a hospital automatically and immediately when a widespread disaster strikes? In a widespread emergency, will hospitals be one of the first agencies supported by local hams, not an afterthought? Are there enough hams in ARES®/RACES to support your hospitals in addition to your commitments to Red Cross, government, and so on? Have the hams received training in the nature of the hospital environment and the special communications needs of hospitals? Do the hams carry "go kits" so they can rapidly set up to provide communications in the hospitals, whether fixed equipment is in place at the hospital or not? Are the hams prepared and trained to provide internal (unit-to-unit) as well as external (hospital-to-outside-world) communications? Is everyone's equipment always organized and ready, with batteries charged? Do you regularly drill with your hospitals? Do these drills include actual participation from hospital staff, not just a check-in to the area net from a hospital lobby? Does staff participation include going through the activation procedure that would be used in a real emergency? Scoring: If the answer to any of these questions is no, then you cannot say that Amateur Radio is adequately supporting hospitals in your area. What are you going to do about it? How is your facility meeting its Joint Commission (formerly JCAHO) requirement for backup to communication systems? Does your Communications Supervisor and Disaster Committee Chair understand what Amateur Radio is and how backup communications using Amateur Radio can help you in big and small disasters? If yes, have you made an effort to contact Amateur Radio operators in your area to form an alliance? If yes, has your Administrator formalized this alliance? If yes, have you discussed all of the following with the hams? If yes, have you followed through with all of the following? Scoring: If any answer is no, take corrective action now. The next disaster could happen at any time. Planning for communications backup is an important part of pro-active patient care. 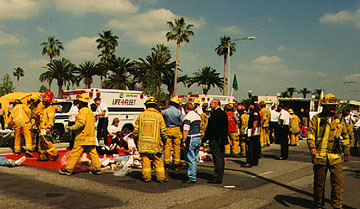 When a mass casualty incident occurs, large numbers of patients are transported to area hospitals. Communications channels are heavily used by local officials, rescue workers, medical personnel, media, and family members, often resulting in disruptions within the community and within the hospital. Amateur Radio operators can provide vital communications backup if there is advance planning and a well-tested alerting system. Copyright ©2018 Joseph and April Moell. All rights reserved. Republication without permission is prohibited.